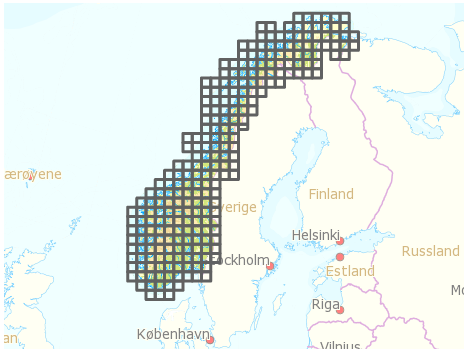 Earlier this year the Norwegian Mapping Authority released a bunch of free data, including Digital Elevation Model (DEM) files that describe the terrain of Norway in high detail. 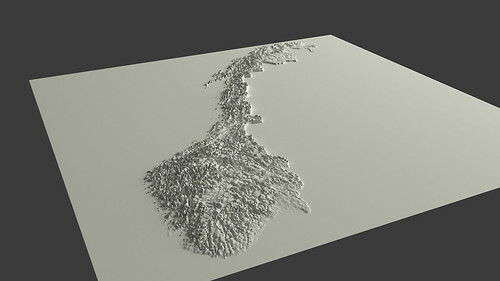 I wanted to use this data to create a 3D model of Norway that I eventually could 3D print. This turned out to be a bit complicated, so I want to share some of my experiences in case anyone else wants to do something similar. So yes, this will be a bit technical. After registering and logging in to data.kartverket.no you are ready to download the files. But don’t think you get one file for the whole of Norway! First, you have to figure out which files to download (I used ‘Digital terrengmodell 10 m , UTM 33’), and then select and download 254 individual files one by one to get all the tiles you need. -ps 100 100 specifies the resolution for the output file. Higher number: smaller output file. -init 255 specifies color range. -o merged.tif specifies the output file. *.dem uses all the DEM files in the current folder as input. See full gdal_merge documentation for more. GeoTIFF files are similar to regular TIFF images, but they store a lot of additional geospatial data. You may open the file in Photoshop, but you will probably just see some basic black and white contours. One of the simplest ways to create a landscape in 3D is to use a greyscale heightmap, and displace a surface according to the image. 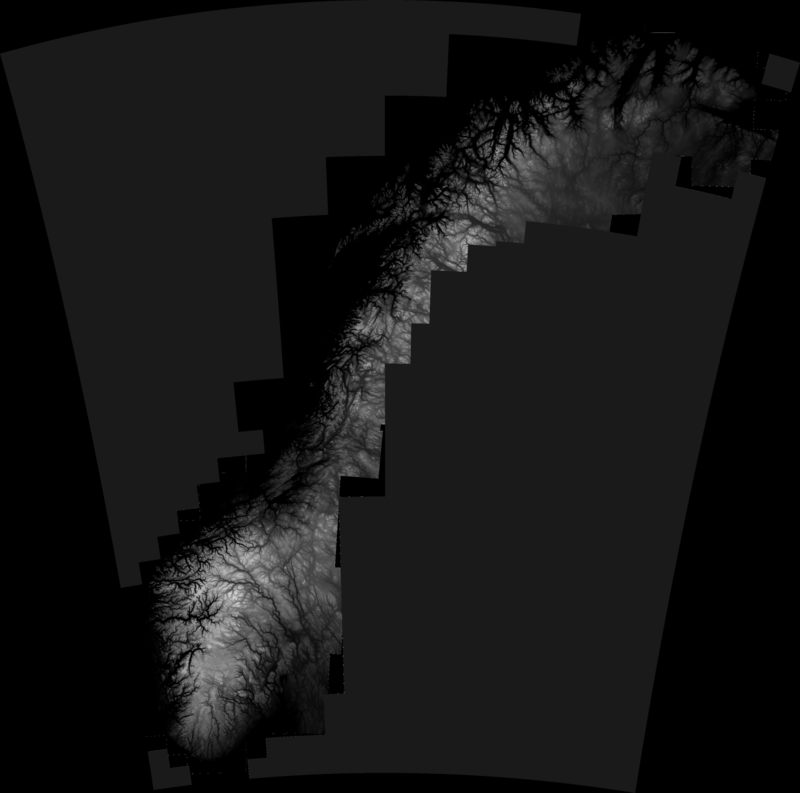 A heightmap is basically just an image in which color represents height, from low (black) to high (white). There are probably other more sophisticated ways of creating a 3D surface, but this is at least quite straightforward. -b 1 select input band 1 (don’t even ask me). -scale -20 2500 set height/color range from -20 m (black) to 2500 m (white). -of PNG specify output file format. By the way, it looks even cooler with inverted colors, don’t you think? 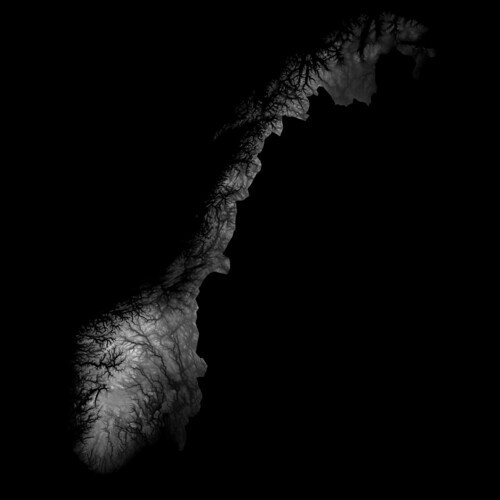 The fjords and the mountains look like veins in some kind of alien organism..
Go to edit mode (Tab), and subdivide the plane (W). More subdivisions will give you more detail, but also a very heavy model. You can probably see that I have exaggerated the height a lot in this particular model. Otherwise it would probably be hard to see any landscape at all. 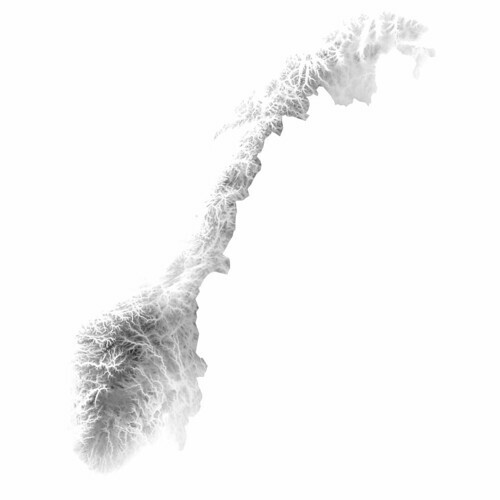 Actually, when I look at it, I find this to be an interesting visualization in itself; by exaggerating the height, it is possible to get an impression of the topography of different areas of Norway in one picture, which otherwise would be impossible to achieve. Wouldn’t it be cool to 3D print this? Oh yes, I’ll get back to that. And why I wish the earth was flat. This is awesome! Im impressed with the size of the 3d surface model that you have created. Currently I am working on modeling 500 acres of surface from a geotiff file supplied by an outside source and am processing the data using AutoCAD Civil 3D 2016. Much to my dismay the program runs incredibly slow and boggs down quite a bit when executing certain modeling commands. Would you have any advice on the kind of processing and memory that would be sufficient for a project of this type? * I also have design items such as berms, roadway, and channels that are being added to this surface in seperate files and Data Shortcut into the final model. (Are you familiar with these terms?) I can provide a more thorough explanation if needed. Any advice would be greatly appreciated! Hi Shannon, unfortunately I don’t have any experience working with AutoCAD Civil 3D. However, if the geotiff file is very large you might get better performance by reducing the resolutions and size of the file. The tool I use for working with geotiff files is GDAL. Or, you could simply ask to get the file in a smaller size. Other than that I’m afraid I can’t help you, since I don’t have experience with your setup.